WebStorm 8 was right around the corner. Now that TypeScript is at 1.0.1 and WebStorm has released 2 revisions (at version 8.0.2 now), I think its high time we see how good WebStorm’s support for TypeScript really is. This puts a weird internal text next to your function, which obviously is incorrect code. All these refactoring bugs are 100% reproducible and of course these are just a few examples. If Jetbrains doesn’t want to support these refactorings, it should just remove them from the available options. There is no excuse for screwing up people’s code. Both Visual Studio and Eclipse TypeScript plugins will detect the typescript files in a project and automatically make the symbols of each file available in other, regardless of whether its manually referenced or not. This is needed because while you may have the code split across files, during the build stage you may end up concatenating those files, thus not needing to manually reference each file. Webstorm however will just mark your file full of errors if you don’t include all the files that are referenced in each file. Yes, you read that correct. There is no way to change the highlighting of your TypeScript code! My Webstorm highlights class names with red. 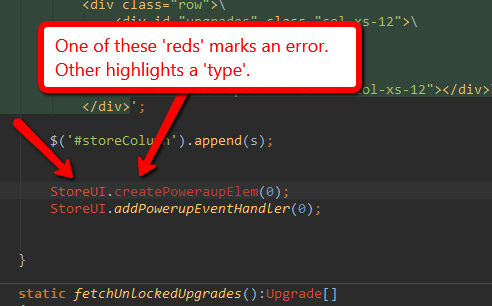 Red is also what Webstorm uses to highlight incorrect symbol names in your code. Thus scrolling through code I now have no idea whether the red I see is correct code or not. The editor does not understand method overloads. As you can see in the image, the method separator line is shown for each of the oveloads (it should just one for the entire constructor, including overloads). This means when you tell Webstorm to format your code, there will be extra newlines between the overload definitions, thus screwing up your formatting. WebStorm is a different story however. The same file when saved will show a progress indicator at the bottom for many seconds showing the file being compiled. Maybe its because they use the awful File Watchers, instead of a more integrated system. But either way, the end user experience and speed of development is highly impacted due to the slow build time. 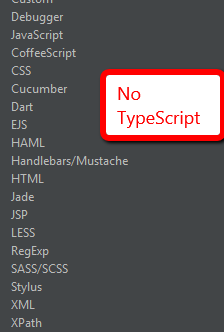 Bottom line, if you are using TypeScript, don’t use WebStorm. Eclipse remains the only usable multi-platform TypeScript IDE.